As promised, here are pictures of some of my new stamp designs as well as some sample cards that I made for Stitches. 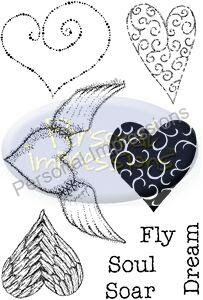 This first set is called Fly Soul Soar Dream (PICSA6201) and is an A6 clear polymer set. You can see the stamps used on some of the ATC's which are on the tiered display which I showed in my last post. Not stamps obviously, but I wanted to share this picture of one of the displays from the PI stand....look at all those lovely Petaloo flowers! Looking forward to using some of these. 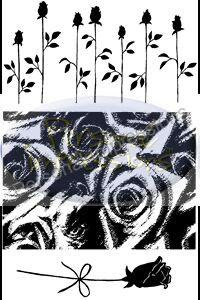 Next is a card which I made using a background stamps from my new set, below, which is called Rose Galore (PICSA6202). I repeated the background stamp several times around the card using a Sepia Archival ink pad and then smudged over it with Tumbled Glass Distress ink. The message is stamped using my new Sending Words of Love set, which has three verses in it. They can be used inside cards of course, but I do like to use verses on the front as well. I alcohol inked the Petaloo flowers and simply added them at the base of the panel. 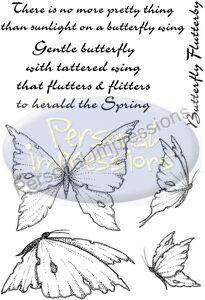 The next set is called Tattered Butterflies (PICSA6213) and comprises four various flutterbies and three text images. This is quite a delicate set but not too tricky for cutting out the images. I'd suggest stamping one image directly onto a card and then cutting off the antennae from a second butterfly to overlay the first one. This is what I did here, though I must apologise for the terrible colours here! The actual card is in delicate mauves and pinks but, for some reason, my camera has taken to intensifying purples into blue instead. Even some altering of the colour hues didn't help, but hope this gives you an idea of the way I used the stamps anyway. Next are three sets that are designed to work either alone or in tandem. These seemed to be the most popular of my new sets so hope you like them. I wanted to do some more quirky designs this year, and images that you might like to use on journal pages too. 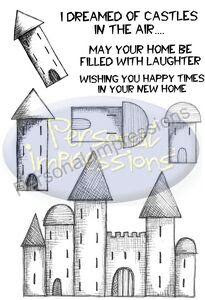 The first set is called I Dreamed of Castles (PICSA6206) and is designed so that you can build up a small or large castle in any combination you fancy. It looks good stamped over book pages, as per my sample, but works equally well for a glittery, princess card. If you leave tabs at either side of the main castle you can bend these under and attach the image to the card with them, enabling you to curve the image. 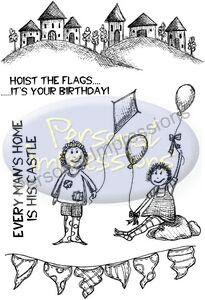 Next is a set called Hoist the Flags (PICSA6207) with some matching buildings, quirky characters and bunting - I've used this set on the card below as well as using the buildings on the card further down. For this card I stamped onto Gloss card, coloured in using Le Plume pens for a really vivid look. I decoupaged some of the bunting, the kite and balloons. 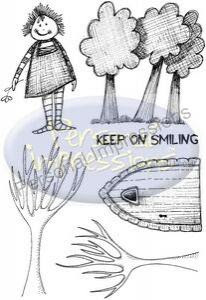 The third set in this series is called Keep on Smiling (PICSA6208) with a larger character, various trees and the gothic style arched door. I used the trees on the following card, mounting all the images over a Distress inked background. Notice the text on the castle from the book pages which I adhered to plain card first to give strength. The castle was coloured by lightly scribbling Le Plume pens across the book paper. I cut out the extra towers and curved each around a pen before adding them using 3D foam for dimension. These are just a few of my new designs, but if you'd like to see more, please go to http://www.personalimpressions.com/ , go to "products" and scroll down until you see "Lindsay Mason for Personal Impressions". If you click this icon it will take you to all my stamps, cardstock etc. My new designs are on pages 6 and 7 of clear A6 designs, as well as in the unmounted rubber section, where my new ATC designs can be found. Do also check out new designs by my friend Andy Skinner, some of whose stamps I used on this card below. I used a background of dots by Marion Emberson before stamping and cutting out various of Andy's images. Great designs aren't they? Well, I have been making a couple of Shadow Boxes today, which I'll photograph and show you after the weekend as they are packed away for my demonstration at The Art Shop in Darlington on Saturday. I'm travelling up there tomorrow and will be scouring some of the Darlington charity shops for some extra bits and pieces for next weekend's Shadow Box workshop. Fingers crossed that I find a few unusual little nick nacks! Your new stamps are absolutely adorable, if you don't mind me saying, I think that they reflect your pleasant and fun loving personality, and the content you write on your blog so very well. I about to order some of your stamps. I especially like Gabrielle, and Humbert and Spider Boy - they are delightful! But I love them all Mmmmmmm decisions, decisions. Congrats to you! I love your designs, and managed to get a set of the fly, dream, soar lovehearts designs... They have remained in their original packaging, until i was able to sort my craft space (today), and I was surprised to find that they had basically melted and crumbled, and there was a strong smell of plastic and alcohol coming from them. Have you heard anything similar about your stamps? I'm curious because all of the other clear stamps i had stored in the same box were all absolutely fine. Sorry to be posting negatively, I'm just curious about whether i perhaps just got a bad batch.